One of the best things to do is have a barbecue on your deck. Here’s our tips on how to make it great. First of all, be safe. Avoid any possible fire hazards, like having your barbecue in an unstable position on your deck and anything flammable near it. When finished (if you don’t use a gas barbecue), dispose of your coals safely. Do not dump it anywhere else that might cause a fire. You should also be careful cooking foods on your barbecue. Make sure everything is thoroughly cooked and check for pink meat on the inside, even if it’s charred on the outside. If you are using a gas BBQ, then make sure you use the right type of gas for it. Keep plenty of clearance around it and never use it in a confined space. When done, remove excess fat to keep it from becoming a fire hazard, and don’t use your gas barbecue on a windy day, or one of the burners might blow out, which can cause gas leaks and explosions. Second, use fresh foods. It will bring the quality of your foods up drastically if you use fresh ingredients instead of frozen or canned. Third, throw all your Lamb cutlets, Snags and Shrimp on your BBQ. Or try this awesome Aussie barbecue burger recipe that you and your guests will love. In a food processor place the onion and flat leaf parsley and blitz until finely chopped. Add this to the mince, tomato sauce, Worcester sauce, egg, seasoning and the breadcrumbs mix thoroughly. Make your classic burger shapes and refrigerate for about 20 minutes. Heat your BBQ, add the slices of bacon and cook for a couple of minutes till they begin to crisp up, take off the grill and cover with a little foil. Then place the burger on the grill and cook for around 5 minutes, or until almost cooked, turning once. 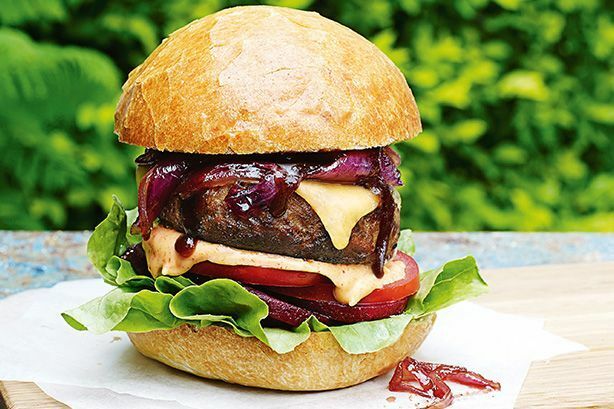 When nearly cooked to your liking , place a bacon rasher and a cheese slice on each burger, leave on the BBQ until you see the cheese begin to melt. Spread hamburger bun bases with mayonnaise. Top with lettuce, tomato, beetroot then add the burger. Cover with bun tops. Serve immediately for the ultimate upside down experience!